“Come On, Baby.” Composed by Sidney Clare, Archie Gottler, and Maceo Pinkard (1928). Recorded the Rhythm Maniacs with vocalist Elsie Carlisle at the Chenil Galleries Studios in Chelsea on August 23, 1929. Decca F. 1528-2. On August 23, 1929 Elsie Carlisle recorded three songs for Decca (“Why Can’t You?” “Come on, Baby,” and “He’s a Good Man to Have Around”) with a band known variously as the Rhythm Maniacs and as Philip Lewis and His Dance Orchestra. This was a studio band, and Philip Lewis the recording manager for Decca; it was really the great Arthur Lally (pictured above) who led the sessions. An Ambrose Orchestra saxophonist, Lally also directed a great many sessions at Decca and Filmophone between 1929 and 1932 under various band names and oversaw the making of some of the “hottest” dance band music of the period. “Come On, Baby” begins and ends with primal, saxophone-dominated instrumental segments, with Elsie singing for a mere 42 seconds in the middle of the song. She delivers the flirtatious lyrics with considerably more fervor and desperation than other contemporary singers. Her final appeal, “Come on, and let your conscience guide you,” concluding with “Oh BABY, come on!” conveys an impression of passionate urgency. We have an earlier take of this song made the same day, and it is interesting to hear the development that the band and Elsie make over the course of the session. The first take is instrumentally weaker; it lacks the punch of the final recording as issued by Decca. Elsie begins on the wrong note – it is humbling to hear her make such a mistake – but she recovers admirably. There is also an alternate take from that session of “He’s a Good Man to Have Around,” in which she noticeably sings a note natural when it should be flat. Here we have, perhaps, a glimpse into the fast-paced life of these recording artists, who could have a weak start to a session but still turn out an excellent final product. “Come On, Baby” had been popular the previous year in America. Between September and December 1928 there were versions by Allister Wylie and His Coronado Hotel Orchestra, Lou Gold and His Orchestra, Ted Weems and His Orchestra, Fred Hall and His Sugar Babies, Ernie Golden, Meyer Davis and His Orchestra (as The Park Inn Good Timers, with vocals by Smith Ballew), and Fletcher Henderson and His Orchestra. British recordings of “Come On, Baby” date from September 1929 to January 1930, with versions by the Rhythmic Eight, Ray Noble’s New Mayfair Dance Orchestra (in a “Paul Jones” medley), Ray Starita and His Ambassadors’ Band (Eddie Grossbart, vocalist), Jack Hylton and His Orchestra (Sam Browne, vocalist), Bidgood’s Broadcasters (vocalist Tom Barratt), Arthur Roseberry and His Dance Band (as Barry Bryan and His Syncopators, with Pat O’Malley and possibly Len Lees doing the singing), Jay Wilbur and His Orchestra (as the Brooklyn Broadcasters, with Tom Barratt as vocalist), Cecil and Leslie Norman (as Norman Sissel and His Rhythm Twisters, with Cavan O’Connor doing the singing), Hal Swain and His Band (vocalist Hal Swain), Ronnie Munro’s Parlophone Variety Company (in their “Talkieland Selection”), Nat Star and His Dance Orchestra (as Eugene Brockman’s Dance Orchestra), Jay Whidden and His Band (vocalist Jay Whidden), and Harry Hudson’s Plaza Band (with vocalist John Thorne). There were also recordings of the song by the Trix Sisters in August 1929, and by Miriam Ferris in October 1929. Comedienne Dorothy Ward was noted for her performance of it in a Julian Wylie pantomime of “Robinson Crusoe” at The Palace, Manchester that same year. 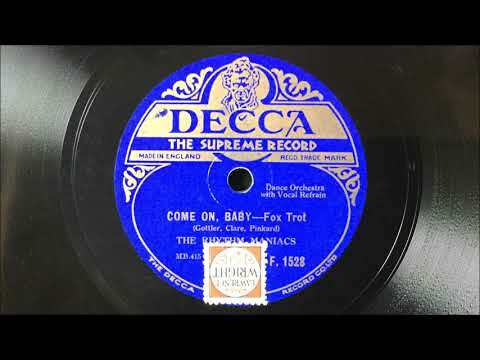 It has always seemed odd to me that a song entitled “Come On, Baby” would not actually have that phrase in its lyrics (“Oh, baby, come on!” is as close as it gets). Such is human perversity.